The Thing About My Folks Movie Sometimes the fruit falls very far from the tree. The Thing About My Folks release date was Friday, September 16, 2005. 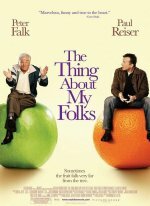 "The Thing About My Folks", starring Peter Falk and Paul Reiser, is a semi- autographical film that Reiser wrote specifically for Falk, his all-time favorite actor. A sudden family crisis throws a befuddled writer and his "loose cannon" dad together for an unexpected road trip. Family secrets are uncovered and in a few surprising days, the two men learn more about each other—and have more fun—than either imagined possible.